Northumbria’s international reputation as a leading British university is the result of a distinctive combination of outstanding academic research and teaching, innovative programmes, traditional values and social and cultural diversity. Since its foundation in the historic City of Newcastle upon Tyne, the University has developed into a successful regional, national and international institution. By the year 2000 Northumbria University was the largest university in the North East of England, with a broad portfolio of courses and a rich cultural diversity in its student population. Northumbria has a student population of around 32,000 with 3,300 overseas students on our Newcastle campuses and a further 3,000 studying on University programmes in their own countries. You might enjoy reading a longer account of our history. 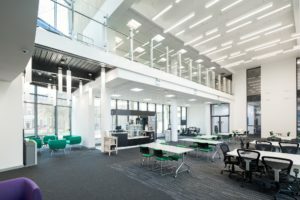 ICAD 2019 will take place on Northumbria’s main City Campus and is hosted by the Department of Computer and Information Sciences (CIS). The brand new CIS building will be the main hub for ICAD 2019. The CIS building atrium will be used as the conference registration point and will serve as the main conference meeting point and refreshement area. The Student Think Tank will take place in the CIS building on Sunday 23 June. 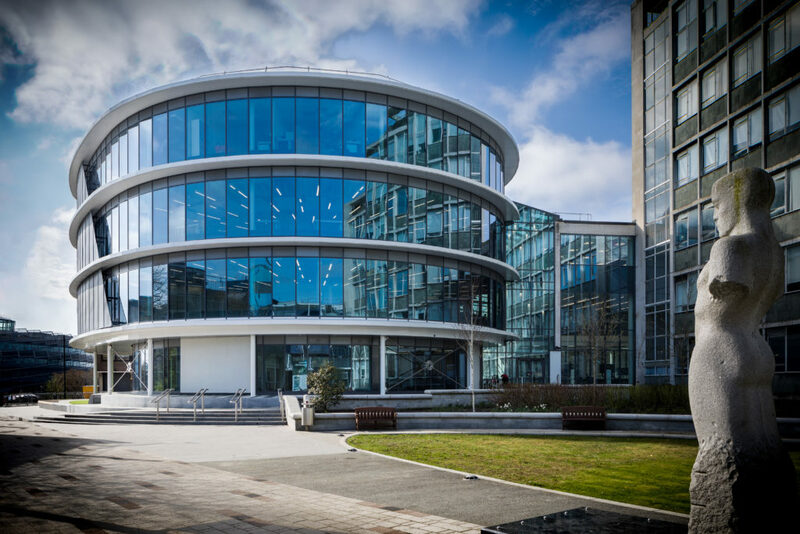 The main conference track (papers, keynotes, etc) will be held in Nixon Hall in Wynne Jones Building which is next door to the CIS building (Monday 24, Tuesday 25, Thursday 27 June). The workshops and tutorials will take place in the CIS building and the adjoining Ellison Building. Note, the map below shows the old Rutherford Hall which has been replaced by the CIS Building. This link shows the building as it is now on Google Maps. The Sonification Concert will take place in the Ballroom at Culture Lab on the evening of Tuesday 25 June. The conference banquet will be held on the evening of Wednesday 26 June at the Wylam Brewery in nearby Exhibition Park, a pleasant 15-20 minute walk from the main conference venue. Newcastle upon Tyne sits on the northern bank of the River Tyne in the county of Tyne and Wear, north-east England. It boasts a rich, diverse history that is evident from a short wander around the city centre – the oldest structure in the city, an 11th century castle keep, and the award-winning Millennium bridge, opened 2001, are within a 15 minute walk from each other. One of the area’s more notable periods in history was the industrial revolution and its role as a powerhouse for shipbuilding and engineering. Famous inventions and builds from the area at this time include Robert Stephenson’s Rocket (an early, and highly innovative, steam locomotive), Sir Charles Parson’s steam turbine (providing plenty of cheap electricity), Sir Joseph Wilson Swan’s incandescent lightbulb, and William Armstrong’s range of artillery. A significant landmark built at that time is the Victoria Tunnel; a 4km underground wagonway built to transport coal from a local mine to the shipyards. After significant investment and renovation, parts of the tunnel are open for tours today. Further, the theme of innovation continues through to modern times, with Newcastle hosting the UK’s first biotechnology village, The Centre for Life, as well as a growing digital technology sector. Today, Newcastle is known for being one of the most vibrant cities in the UK. It is particularly famous for its modern nightlife, as well as its traditional British pub culture. There are plenty of independent cafés, pubs, and restaurants if you want to grab some food (or “scran” if you use the local dialect). A bespoke google map with recommendations will be made available before the conference. Local delicacies include ‘pease pudding’ (think hummus but made with split yellow peas), ‘stotties’ (just, really big bread rolls, if we’re honest), and the city’s world-famous export Newcastle Brown Ale (although since 2017 it’s actually been brewed in the Netherlands, but we try not to talk about that…). Most importantly, the locals (“Geordies”) are welcoming, making Newcastle a friendly city to visit. The Tyne Bridge is a through arch bridge over the River Tyne built from granite and steel painted green. The bridge spans 531 feet (162 m) and the road deck is 84 feet (26 m) above the river level. 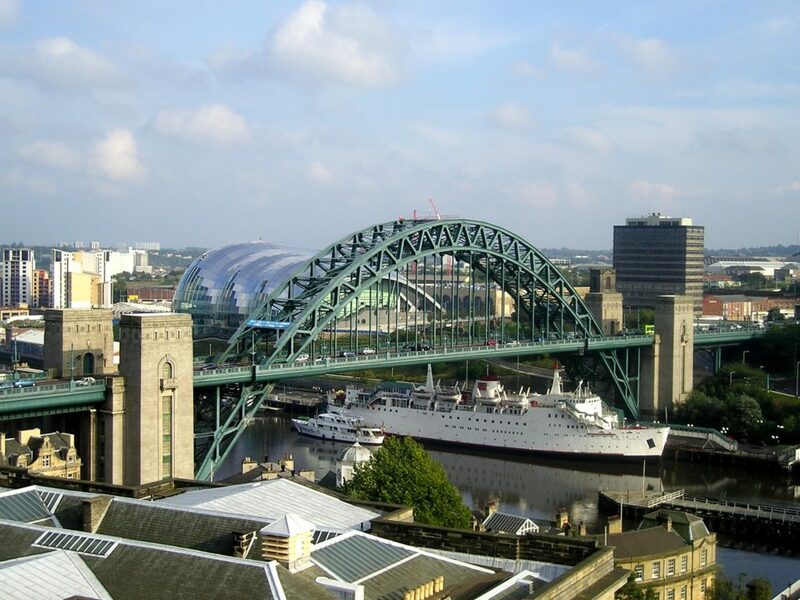 Travel across the River Tyne using one of the many bridges, the most recognisable being the Tyne Bridge, and you are in Newcastle’s southern neighbour, Gateshead. While less well-known, this smaller city is teeming with culture and artistry. On the Gateshead Quayside you’ll find The Baltic Centre for Contemporary Art and the Sage Concert Venue. Both architecturally imposing, The Baltic is a renovated flour mill originally built in the 1950s, whereas the Sage was built in the early 2000’s. The best time to see the Quayside is when it is dusk or night time – all the monuments will be beautifully lit up. Moving away from the river, the most famous of Gateshead’s landmarks is The Angel of the North, a steel sculpture by artist Anthony Gormley. Built on top of a former coal mine, the Angel measures 66 foot high and has a wing span of 177ft. With Newcastle having so much to offer visitors, and our exciting conference schedule as well, we’re sure you’ll have a canny (good) time! We look forward to welcoming you to Newcastle upon Tyne! 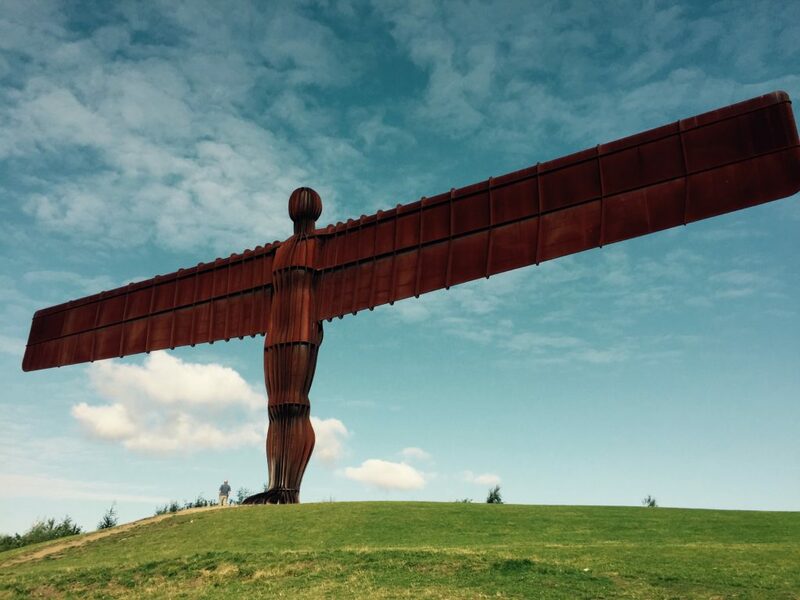 The Angel of the North Statue is a steel sculpture of an angel, 20 metres (66 ft) tall, with wings measuring 54 metres (177 ft) across. 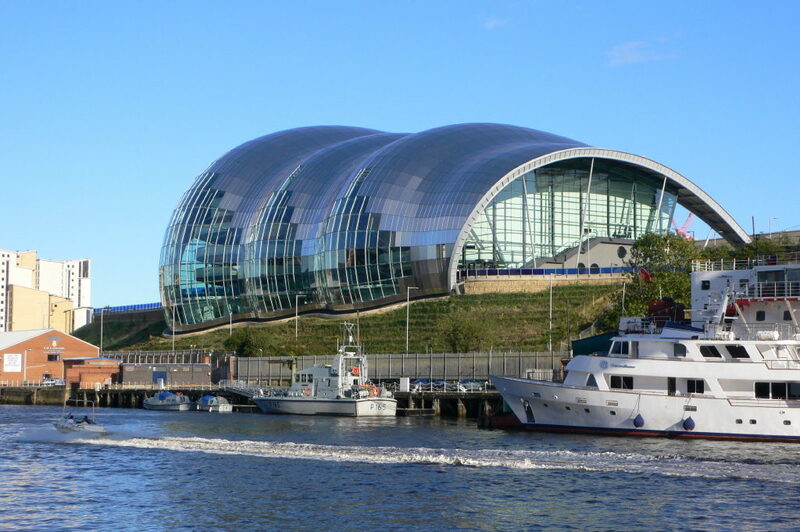 The Sage Gateshead is a curved glass and stainless steel building. A separate accommodation site has been setup for special rates on places throughout the city for your stay during the conference. Direct rail services run from many UK cities to Newcastle Central Station (approximately 1h 30mins to Edinburgh and 3h from London). If traveling long distances by rail, it is recommended to buy the tickets in advance, as the cost may be expensive when purchasing on the day of travel. Metro is the North East’s urban transit system. With 60 stations spread across the heart of Tyne and Wear you can easily travel from Sunderland, Gateshead and across Newcastle to visit Northumbria University.